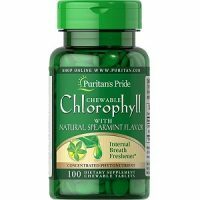 Puritan's Pride Chewable Chlorophyll Review - Does It Work? This review is going to take a closer look at Puritan’s Pride Chewable Chlorophyll in order to learn more about how it works and to see if it can really offer long-lasting relief from bad breath. This product is a dietary supplement that is made up of two active ingredients, chlorophyll and mint, that are designed to offer immediate and long-lasting fresh breath. The mint is designed to offer immediate relief and the chlorophyll works by removing odor-causing toxins from inside your system. The manufacturer claims that by taking this product you will experience relief from bad breath that is caused by indigestion, dentures, smoking, alcohol and sharp foods. 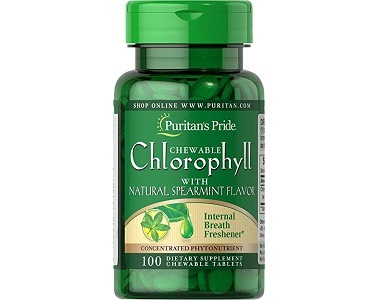 What’s in Puritan’s Pride Chewable Chlorophyll? Inactive Ingredients: Sorbitol, Sucrose, Glycine, Natural Spearmint, Silica, Vegetable Stearic Acid. Chlorophyll is the chemoprotein in green plants that gives the plant its green color. It is similar in structure to human hemoglobin but while hemoglobin contains iron, chlorophyll contains magnesium. It is believed to remove toxins from the colon which is widely believed to be the main cause of body odor and bad breath. The mint in this product is incorporated to offer instant relief from bad breath. The manufacturer does not share the amounts of each ingredient and does not disclose any additional ingredients. We were able to find the complete list of ingredients through our independent research. Without knowing the amounts of each ingredient, there is no way to know if there is enough of the ingredients for this product to be effective. How Do You Use Puritan’s Pride Chewable Chlorophyll? The manufacturer says you can take these chewable tablets as needed. If you are pregnant, nursing or under medical supervision, you should talk to your doctor before taking this product. You can purchase this product directly from the manufacturer and from third-party retailers. You can only purchase in bulk quantities. They offer a buy-one-get-two-free deal for $4.49 for all three bottles and a buy-two-get-four-free deal for $8.98 for all six bottles. Puritan’s Pride offers a full year to obtain a refund on all of their products. 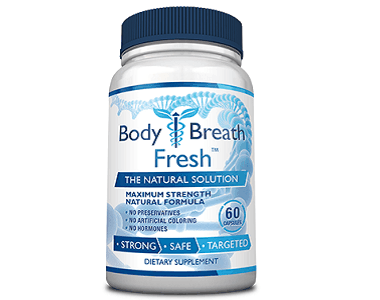 This Chewable Chlorophyll supplement appears to be a promising supplement that can possibly help offer you relief from bad breath. It is made up of two active ingredients, chlorophyll and mint, that are designed to help offer immediate and long-lasting relief from bad breath. It comes in chewable tablets so that the mint can release and offer immediate relief from bad breath. However, the manufacturer does little to offer any information about this product. They do not share the dosage information or label facts which means that there is no way for us to know what other ingredients are in this product or if there are enough of the key ingredients in order for this supplement to be effective. The consumer feedback we saw suggests that there may not be enough of each ingredient because consumers reported that this product does not work. They claimed that after continuously taking these tablets as instructed by the manufacturer, they did not see any improvement in their bad breath. You are better off purchasing an internal breath freshener that offers full disclosure product information and one that has positive consumer reviews.